100 Raoul Wallenberg Place, SW Washington, D.C. The United States Holocaust Memorial Museum (USHMM) is the United States' official memorial to the Holocaust. Adjacent to the National Mall in Washington, D.C., the USHMM provides for the documentation, study, and interpretation of Holocaust history. It is dedicated to helping leaders and citizens of the world confront hatred, prevent genocide, promote human dignity, and strengthen democracy. With an operating budget of just under $78.7 million ($47.3 million from Federal sources and $31.4 million from private donations) in 2008, the Museum had a staff of about 400 employees, 125 contractors, 650 volunteers, 91 Holocaust survivors, and 175,000 members. It had local offices in New York, Boston, Boca Raton, Chicago, Los Angeles and Dallas. Since its dedication on April 22, 1993, the Museum has had nearly 30 million visitors, including more than 8 million school children, 91 heads of state and more than 3,500 foreign officials from over 132 countries. The Museum's visitors came from all over the world, and less than 10 percent of the Museum's visitors are Jewish. Its website had 25 million visits in 2008 from an average of 100 different countries daily. 35% of these visits were from outside the United States, including more than 238,000 visits from Muslim-majority countries. The USHMM’s collections contain more than 12,750 artifacts, 49 million pages of archival documents, 80,000 historical photographs, 200,000 registered survivors, 1,000 hours of archival footage, 84,000 library items, and 9,000 oral history testimonies. It also has teacher fellows in every state in the United States and almost 400 university fellows from 26 countries since 1994. Researchers at the United States Holocaust Memorial Museum have documented 42,500 ghettos and concentration camps erected by the Nazis throughout German-controlled areas of Europe from 1933 to 1945. On November 1, 1978, President Jimmy Carter established the President’s Commission on the Holocaust, chaired by Elie Wiesel, a prominent author and Holocaust survivor. Its mandate was to investigate the creation and maintenance of a memorial to victims of the Holocaust and an appropriate annual commemoration to them. On September 27, 1979, the Commission presented its report to the President, recommending the establishment of a national Holocaust memorial museum in Washington, D.C. with three main components: a national museum/memorial, an educational foundation, and a Committee on Conscience. After a unanimous vote by the United States Congress in 1980 to establish the museum, the federal government made available 1.9 acres (0.77 ha) of land adjacent to the Washington Monument for construction. Under Director Jeshajahu Weinberg and Chairman Miles Lerman, nearly $190 million was raised from private sources for building design, artifact acquisition, and exhibition creation. In October 1988, President Ronald Reagan helped lay the cornerstone of the building, designed by the architect James Ingo Freed. Dedication ceremonies on April 22, 1993 included speeches by American President Bill Clinton, Israeli President Chaim Herzog, Chairman Harvey Meyerhoff, and Elie Wiesel. On April 26, 1993, the Museum opened to the general public. Its first visitor was the 14th Dalai Lama of Tibet. In 1999, the Museum’s governing body, the United States Holocaust Memorial Council, elected Sara J. Bloomfield to be the USHMM’s second director. Under Bloomfield’s leadership, the Museum has created programs including the National Institute for Holocaust Education, Center for Advanced Holocaust Studies, and Academy for Genocide Prevention. She has also played leading roles in opening the International Tracing Service archive, negotiating the first-ever loan of Anne Frank’s original writings, and professionally advising museums and groups such as the Jewish Museum Berlin, the Argentine government’s memorial to the Dirty War, the Holocaust museum in Buenos Aires, the memorial committee at Ground Zero in New York, and the Iraq Memory Foundation. The museum has been the target of a planned attack and of a fatal shooting. In 2002, a federal jury convicted White supremacists Leo Felton and Erica Chase of planning to bomb a series of institutions associated with American black and Jewish communities, including the USHMM. On June 10, 2009, 88-year-old James von Brunn, an anti-Semite,  when he died on January 6, 2010 in Butner federal prison in North Carolina. Raoul Wallenberg Place Entrance of USHMM. Three large façades made of brick and limestone. In the foreground a black modern art statue. Bridges in the USHMM. 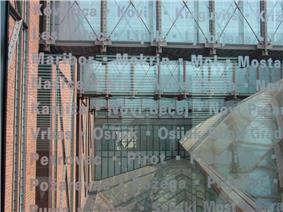 Blue glass etched with names and places lost during the Holocaust. Designed by the architect modern architecture of Washington, D.C. 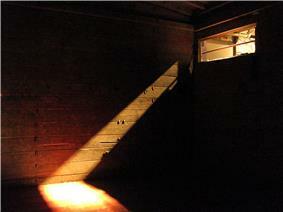 Upon entering, each architectural feature becomes a new element of allusion to the Holocaust. In designing the building, Freed researched post-World War II German architecture and visited Holocaust sites throughout Europe. The Museum building and the exhibitions within are intended to evoke deception, fear, and solemnity, in contrast to the comfort and grandiosity usually associated with Washington, D.C. public buildings. Other partners in the construction of the USHMM included Weiskopf & Pickworth, Cosentini Associates LLP, Jules Fisher, and Paul Marantz, all from New York City. The Museum's Meyerhoff Theatre and Rubenstein Auditorium were constructed by Jules Fisher Associates of New York City. The Permanent Exhibition was designed by Ralph Appelbaum Associates. The USHMM contains two exhibitions that have been open continuously since 1993 and numerous rotating exhibitions that deal with various topics related to the Holocaust and human rights. The Hall of Remembrance is the USHMM's official memorial to the victims and survivors of the Holocaust. Visitors can memorialize the event by lighting candles, visiting an eternal flame, and reflecting in silence in the hexagonal hall. Using more than 900 artifacts, 70 video monitors, and four theaters showing historic film footage and eyewitness testimonies, the USHMM’s Permanent Exhibition is the most visited exhibit at the Museum. Upon entering large industrial elevators on the first floor, visitors are given identification cards, each of which tells the story of a random victim or survivor of the Holocaust. Upon exiting these elevators on the fourth floor, visitors walk through a chronological history of the Holocaust, starting with the Nazi rise to power led by Adolf Hitler, 1933-1939. Topics dealt with include Aryan ideology, Kristallnacht, Antisemitism, and the American response to Nazi Germany. Visitors continue walking to the third floor, where they learn about ghettos and the Final Solution, by which the Nazis tried to exterminate the European Jews, and killed six million, many in gas chambers. The Permanent Exhibition ends on the second floor with the liberation of concentration camps by Allied forces; it includes a continuously looped film of Holocaust survivor testimony. First-time visitors spend an average of two to three hours in this self-guided exhibition. Due to certain images and subject matter, it is recommended for visitors 11 years of age and older. To enter the Permanent Exhibition between March and August, visitors must acquire free timed passes from the Museum on the day of the visit, or online for a service fee. Remember the Children: Daniel's Story is an exhibition designed to explain the Holocaust to elementary and middle school children. Opened in 1993, following its original inception at the Children's Museum in Washington DC in 1988, and reviewed by psychiatrists, it tells the story of Daniel, a fictional child based on a collection of true stories about children during the Holocaust. Daniel is named after the son of Isaiah Kuperstein who was the original curator of the exhibit. He worked together with Ann Lewin and Stan Woodward to create the exhibit. Due to its popularity among families, it is still open to the public today. In October 2009, the USHMM unveiled a memorial plaque in honor of Special Police Officer Stephen Tyrone Johns. In response to the outpouring of grief and support after the shooting on June 10, 2009, it has also established the Stephen Tyrone Johns Summer Youth Leadership Program. Each year, 50 outstanding young people from the Washington, D.C. area will be invited to the USHMM to learn about the Holocaust in honor of Johns' memory. The Museum’s holdings included art, books, pamphlets, advertisements, maps, film and video historical footage, audio and video oral testimonies, music and sound recordings, furnishings, architectural fragments, models, machinery, tools, microfilm and microfiche of government documents and other official records, personal effects, personal papers, photographs, photo albums, and textiles. This information can be accessed through online databases or by visiting the USHMM. Researchers from all over the world come to the USHMM Library and Archives and the Benjamin and Vladka Meed Registry of Holocaust Survivors. In order to fulfill its Congressionally mandated mission, the USHMM conducts a variety of programs. In 1998, the USHMM established the Center for Advanced Holocaust Studies (CAHS). Working with the Academic Committee of the United States Holocaust Memorial Council, the CAHS supports research projects and publications about the Holocaust (including a partnership with Oxford University Press to publish the scholarly journal Holocaust and Genocide Studies), helps make accessible collections of Holocaust-related archival material, supports fellowship opportunities for pre- and post- doctoral researchers, and hosts seminars, summer research workshops for academics, conferences, lectures, and symposia. The CAHS’s Visiting Scholars Program and other events have made the USHMM one of the world's principal venues for Holocaust scholarship. The Museum contains the offices of the Committee on Conscience (CoC), a joint United States government and privately funded think tank, which by presidential mandate engages in global human rights research. Using the Convention on the Prevention and Punishment of the Crime of Genocide, approved by the United Nations in 1948 and ratified by the United States in 1988, the CoC has established itself as a leading non-partisan commenter on the Darfur Genocide, as well as on the war-torn region of Chechnya in Russia, a zone that the CoC believes could produce genocidal atrocities. The CoC does not have policy-making powers and serves solely as an advisory institution to the American and other governments. While standing inside The Hall of Remembrance, was located within the United States Holocaust Memorial Museum, a volunteer read the names of Holocaust victims during the Days of Remembrance of the Victims of the Holocaust. In addition to coordinating the National Civic Commemoration, ceremonies and educational programs during the week of the DRVH were regularly held throughout the country, sponsored by Governors, Mayors, veterans groups, religious groups, and military ships and stations throughout the world. 2011 - Justice and Accountability in the Face of Genocide: What Have We Learned? The USHMM conducted several programs devoted to improving Holocaust education. The Arthur and Rochelle Belfer Conference for Teachers, conducted in Washington, D.C., attracted around 200 middle school and secondary teachers from around the United States each year. The Education Division offered workshops around the United States for teachers to learn about the Holocaust, to participate in the Museum Teacher Fellowship Program (MTFP), and to join a national corps of educators who served as leaders in Holocaust education in their schools, communities, and professional organizations. Some MTFP participants also participated in the Regional Education Corps, an initiative to implement Holocaust education on a national level. Since 1999, the USHMM also provided public service professionals, including law enforcement officers, military personnel, civil servants and federal judges with ethics lessons based in Holocaust history. In partnership with the Anti-Defamation League, more than 21,000 law enforcement officers from worldwide and local law enforcement agencies such as the FBI and local police departments have been trained to act in a professional and democratic manner. A large component of the USHMM was directed towards its website and associated accounts. With a majority of interest coming from the virtual world, the USHMM provided a variety of research tools online. On its website, online exhibitions, the Museum published the Holocaust Encyclopedia—an online, multilingual encyclopedia detailing the events surrounding the Holocaust. It was published in all six of the official languages of the United Nations—Arabic, Mandarin, English, French, Russian, and Spanish; and in Greek, Portuguese, Persian, Turkish, and Urdu. It contained thousands of entries and includes copies of the identification card profiles that visitors receive at the Permanent Exhibition. The USHMM had partnered with Apple Inc. to publish free podcasts on iTunes about the Holocaust, anti-semitism, and genocide prevention. It also had its own channel on YouTube, an official account on Facebook, a Twitter page, and an e-mail newsletter service. The Genocide Prevention Mapping Initiative was a collaboration between the USHMM and Google Earth. It sought to collect, share and visually present to the world critical information on emerging crises that may lead to genocide or related crimes against humanity. While this initiative focused on the Darfur Conflict, the Museum wishes to broaden its scope to all human rights violations. The USHMM wanted to build an interactive "global crisis map" to share and understand information quickly, to "see the situation" when dealing with human rights abuses, enabling more effective prevention and response by the world. Since 1991, the USHMM had created traveling exhibitions to travel all over the United States and the world. These exhibitions have been to over one hundred cities in more than 35 states. It is possible to request and host various subject matters including: "The Nazi Olympics: Berlin 1936", "Nazi Persecution of Homosexuals", and others depending on what a community desires. The museum is overseen by the United States Holocaust Memorial Council, which includes 55 private citizens appointed by the President of the United States, five members of the United States Senate and five members of the House of Representatives, and three ex-officio members from the Departments of State, Education, and the Interior. ^ a b "About the Museum". Ushmm.org. Retrieved 2012-05-03. ^ a b "Press Kit". Ushmm.org. Retrieved 2012-05-03. ^ Lichtblau, Eric. "The Holocaust Just Got More Shocking." The New York Times. March 3, 2013. ^ "President's Commission on the Holocaust". Ushmm.org. Retrieved 2012-05-03. 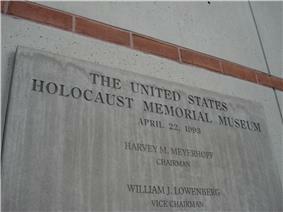 ^ "History of the United States Holocaust Memorial Museum". Secure.ushmm.org. Retrieved 2012-05-03. ^ "Sara J. Bloomfield". Ushmm.org. 2011-06-17. Retrieved 2012-05-03. ^ Haskell, Dave (2002-07-26). "Jury convicts white supremacists". ^ Wilgoren, Debbi; Branigin, William (2009-06-10). "2 People Shot at U.S. Holocaust Museum". ^ Associated Press January 6, 2010, 2:03 p.m. (2010-01-06). "LA Times article on von Brunn's death". Latimes.com. Retrieved 2012-05-03. ^ "Art and Architecture". Ushmm.org. Retrieved 2012-05-03. ^ "The Architecture of the Holocaust". Xroads.virginia.edu. 1985-10-16. Retrieved 2012-05-03. ^ "What's Inside". Ushmm.org. Retrieved 2012-05-03. ^ "Plan a Visit". Ushmm.org. Retrieved 2012-05-03. ^ "Exhibitions". Ushmm.org. Retrieved 2012-05-03. ^ "Collections". Ushmm.org. Retrieved 2012-05-03. ^ "About the Center". Ushmm.org. 2001-03-22. Retrieved 2012-05-03. ^ "About the Committee on Conscience". Ushmm.org. Retrieved 2012-05-03. ^ "Professional Development". Ushmm.org. Retrieved 2012-05-03. ^ "Law Enforcement and Society". Ushmm.org. Retrieved 2012-05-03. ^ "Online Exhibitions". Ushmm.org. Retrieved 2012-05-03. ^ "Holocaust Encyclopedia". Ushmm.org. 1929-06-12. Retrieved 2012-05-03. ^ "USHMM@iTunes". Ushmm.org. Retrieved 2012-05-03. ^ "USHMM Channel". Youtube.com. Retrieved 2012-05-03. ^ "Facebook United States Holocaust Memorial Museum". Facebook.com. Retrieved 2012-05-03. ^ HolocaustMuseum. "HolocaustMuseum". Twitter.com. Retrieved 2012-05-03. ^ "Mapping Initiatives". Ushmm.org. Retrieved 2012-05-03. ^ "Traveling Exhibitions". Ushmm.org. Retrieved 2012-05-03. Belau, L. M. 1998. "Viewing the Impossible: The U.S. Holocaust Memorial Museum". Reference Librarian. (61/62): 15–22. Berenbaum, Michael, and Arnold Kramer. 2006. The world must know: the history of the Holocaust as told in the United States Holocaust Memorial Museum. Washington, D.C.: United States Holocaust Memorial Museum. Freed, James Ingo. 1990. The United States Holocaust Memorial Museum: what can it be? Washington, D.C.? : U.S. Holocaust Memorial Council. Hasian, Jr, Marouf. 2004. "Remembering and forgetting the "Final Solution": a rhetorical pilgrimage through the U.S. Holocaust Memorial Museum". Critical Studies in Media Communication. 21 (1): 64–92. Linenthal, Edward Tabor. 1995. Preserving memory: the struggle to create America's Holocaust Museum. New York: Viking. Pieper, Katrin. 2006. Die Musealisierung des Holocaust: das Jüdische Museum Berlin und das U.S. Holocaust Memorial Museum in Washington D.C. : ein Vergleich. Europäische Geschichtsdarstellungen, Bd. 9. Köln: Böhlau. Strand, J. 1993. "Jeshajahu Weinberg of the U.S. Holocaust Memorial Museum". Museum News – Washington. 72 (2): 40. Timothy, Dallen J. 2007. Managing heritage and cultural tourism resources: critical essays. Critical essays, v. 1. Aldershot, Hants, England: Ashgate. 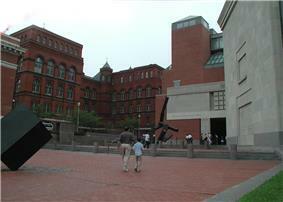 United States Holocaust Memorial Museum. 2001. Teaching about the Holocaust: a resource book for educators. 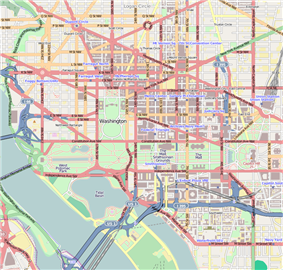 Washington, D.C.: U.S. Holocaust Memorial Museum. United States Holocaust Memorial Museum. 2007. You are my witnesses: selected quotations at the United States Holocaust Memorial Museum. Washington, D.C.: United States Holocaust Memorial Museum. Weinberg, Jeshajahu, and Rina Elieli. 1995. 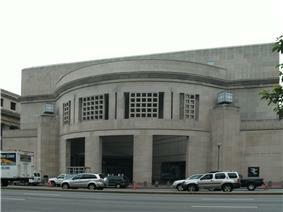 The Holocaust Museum in Washington. New York, N.Y.: Rizzoli International Publications. Young, James E, and John R Gillis. 1996. "The Texture of Memory: Holocaust Memorials and Meaning". The Journal of Modern History. 68 (2): 427. American national museums in Washington, D.C. Ethnic museums in Washington, D.C.
Jews and Judaism in Washington, D.C.